Determining the absorption coefficient of liquids and solids from the absorption properties of their individual molecules is not an easy task because they are sufficiently close together that they interact strongly. This is evident from Figs. 1.11 and 1.12, which show that the spectral emissivity of liquid water bears little resemblance to that of water vapor. Beginning with the latter it is not an easy step to the former. Interactions between water molecules in the liquid phase all but destroy their individuality. For gases and suspensions of particles, however, we do have a hope of determining absorption coefficients beginning with the properties of a single molecule or particle. By particle we mean a bound collection of molecules sufficient in number that it has macroscopic properties such as temperature and pressure. There is no such thing as the temperature or pressure of a molecule. Even the radius of a molecule is a nebulous quantity: every method for measuring molecular diameters yields a different result. A particle may itself be composed of a material with an absorption coefficient, but there is no such thing as the absorption coefficient of a single molecule. All molecules of the same substance are essentially identical, but every particle is unlike every other particle. Like temperature and pressure, absorption coefficient is a statistical quantity, an average over an ensemble of many molecules. We expect the absorption coefficient of a gas to depend on the concentration of its molecules. After all, the inverse of the absorption coefficient is the absorption length, and it would hardly make sense if a gas at one concentration had the same absorption length as the same gas at a higher concentration. The term concentration instead of density is used here to emphasize that absorption of electromagnetic radiation is not fundamentally dependent on mass. Electromagnetic waves exert forces on charges, not masses, which just go along for the ride. When you use the unqualified term density, make sure that you are clear whether you mean mass density (mass per unit volume) or number density (molecules per unit volume). We use number density and concentration to mean more or less the same thing. Suppose that an isolated molecule is illuminated by a monodirectional, monochromatic beam of irradiance F. This molecule absorbs energy, by which is meant it transforms radiant energy into other forms, at a rate Wa, which is proportional to F. The dimensions of Wa are power, whereas those of F are power per unit area. Thus the proportionality factor aa between the two must have the dimensions of length squared (area). For this reason aa is given the name absorption cross section. This is the effective area of the molecule for removing energy from the incident beam, and should not be confused with the geometrical cross-sectional area of the molecule even if such an area had a precise meaning, which it does not. The diameters of the kinds of molecules that inhabit the atmosphere are about 3 x 10~8 cm, which corresponds to geometrical cross-sectional areas of about 7 x 10~16 cm2. But absorption cross sections of molecules are usually much smaller than this value. Equation (2.28) holds equally well if the illuminated object is a particle rather than a molecule. 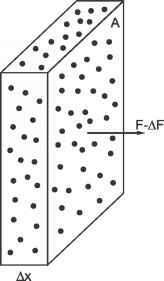 We have more to say about absorption cross sections of particles in Section 2.9. Cross sections of various kinds are fundamental in several areas of physics, common to the kinetic theory of gases, neutron physics, high-energy particle physics, and optics. where k = Na a is the absorption coefficient from Eq. (2.1). Figure 2.6: The irradiance F incident on a slab randomly populated by absorbing molecules is attenuated by an amount proportional to the total cross-sectional area (projected effective area) of all the molecules in the slab. If all orientations are equally likely (random orientation), all cross sections are equally weighted. Another assumption underlying Eqs. (2.31)—(2.33) is that the consequences of interference (coherence) are negligible (see Secs. 3.4 and 5.1). If not, to determine the irradiance transmitted at any x, we could not skip the intermediate step of determining the amplitude and phases of the electric and magnetic fields, from which irradiances follow. The absorption cross section also depends on the polarization state (see Ch. 7) of the beam if the molecule is asymmetric. But if the molecules are randomly oriented, the absorption coefficient of the gas is independent of polarization. Figure 2.7: The square tube is randomly filled with 25,000 particles (black squares). What an observer would see (looking to the right) at different points along this tube is depicted in the squares below the tube. Everything we say about absorption by a gas is equally applicable to a suspension of particles. All that need be done is replace the absorption cross section of a molecule with that of a particle (see Sec. 2.9). Equation (2.7) for exponential attenuation, with the absorption coefficient of a gas (or suspension of particles) given by Eq. (2.31), contains hidden assumptions worth bringing into the open. Even if coherence is negligible, the possibility remains that one molecule or particle can affect absorption by others. Suppose, for example, that a tube contains a fixed number of absorbers each with the same absorption cross section. How they are distributed in space determines attenuation by them. If all the absorbers happen to line up one behind the other, their total projected absorption area is just the absorption cross section of a single absorber. But if they are distributed so that no absorber is behind another, their total projected absorption area is much greater. Attenuation is vastly different for these two spatial distributions even if the total number of absorbers in the tube is the same. All absorbers lined up in a row is physically unrealistic (except in a crystal), but this extreme distribution signals that how the projected absorption areas of the absorbers overlap determines attenuation by them. 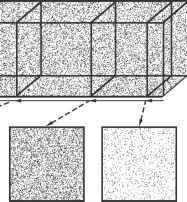 To probe further we did computations for two possible arrangements of absorbers represented by black squares, henceforth called particles. A large square with area 4 units, representing the cross-sectional area of a square tube, was filled with identical particles with cross-sectional area 0.0001 units according to two different prescriptions. 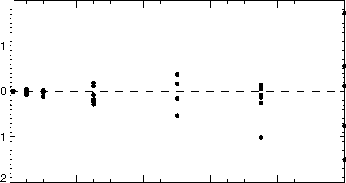 In one prescription the positions of the particles within the large square were randomly chosen, added to the large square one after another, and the total cumulative particle area recorded (Fig. 2.7). The total area of overlap of an added particle with all other particles in the tube was subtracted from the cumulative particle area to produce the total projected area. In the other prescription, the particles were not allowed to overlap. If the position of a particle was such that it overlapped any other, it was relocated to remove all overlap, and hence the resulting distribution of particles was not perfectly random. Figure 2.8: The top figure shows transmissivity versus number of particles for two different prescriptions: overlapping particles (solid circles) and non-overlapping particles (dashed curve). Each solid circle on the solid curve (exponential attenuation) is the result of six sets of calculations for 1000, 5000, 10,000, 25,000, 50,000, 75,000, and 100,000 particles. Because the variation over the six sets is not resolvable in the upper part of the figure, the lower part shows the ratio of the difference between each calculated transmissivity and exponential decreasing transmissivity, relative to exponential decreasing transmissivity. Figure 2.9: Absorption cross section of a water molecule for a temperature of 20° C and a total pressure of 1 atmosphere. closely follows the exponential law exp(-NAp), where N is the total number of particles in the tube and Ap is the cross-sectional area of a particle relative to the cross-sectional area of the tube. 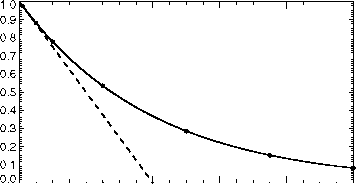 Each dot on the solid curve [exp(-NAp)] in Fig. 2.8 is the result of six sets of calculations, each of which gave slightly different results, although they are not resolvable. To resolve the differences, the lower part of the figure shows the relative deviation of each calculation, defined as the ratio of the difference between the computed transmissivity and that predicted by the exponential law relative to the exponential law. For the non-overlapping particles, transmissivity decreases with particle number more rapidly than exponential, a straight line 1 - NAp. And if all the particles were on a line, the transmissivity would be 1 - Ap for all N > 0. From this we conclude that Eq. (2.7) is applicable to a perfectly random distribution of absorbers. If the positions of absorbers are correlated, the exponential law is called into question, although we know of no experimental evidence that this ever happens to an appreciable extent with atmospheric molecules or particles. condensed to liquid. The quantity Nhaa is the absorption optical depth ra (see Sec. 5.2), which for d =1 cm is 3.3 x 1022 aa, with the cross section in cm2. The absorption cross section of water vapor (Fig. 2.9) varies by more than a factor of 1000 over the range of infrared frequencies shown. At the peaks, the cross section is sufficiently large that the corresponding emissivity is almost 1, at the troughs, much less than 1 (Fig. 1.11). The absorption cross section is not strictly a property of a molecule but depends on interactions with neighboring molecules, even in the gas phase. The positions of the peaks do not change so much as their widths, which is not especially difficult to account for (as we do subsequently). What Fig. 2.9 shows is the absorption coefficient divided by N, which defines the effective absorption cross section, a property of the molecule and its environment, which for our calculations is a total pressure of 1 atm and a temperature of 20 °C. 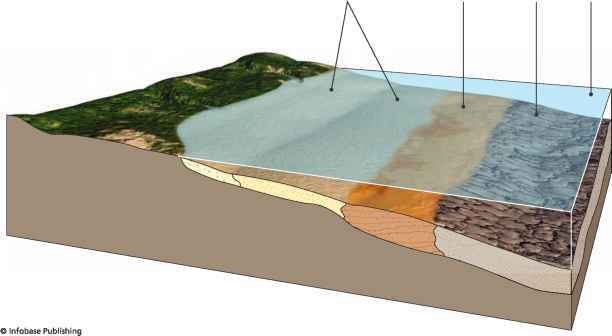 To interpret the frequency dependence of the cross section we must dig deeper. To do so we need the right shovel, the rudiments of complex variables, which we turn to next.